Hello lovely humans of the world. I hope your week is going great so far, I know mine is. The past 2-3 weeks, I've been taking a little bit of a slower pace to my blog and busy schedule. Most people would think it's out of laziness or lack of inspiration, but for me it was strategic. I noticed myself not having time for myself, my prayer time, my friends and family and my mind was going bonkers. Now that I've taken somewhat of a break (-ish, I mean you probably barely noticed) I am rejuvenated and ready to share with you another amazing collaboration. This time I got to work with my Blogger Bestie Mackensey Moor. You guys probably know her from Moor Modern, if not check out her blog here. Today I'm bringing you two 'Road Trip' outfit ideas for those of you fashion lovers. Yes, of course I usually opt for leggings and an oversized sweatshirt, but if you're road tripping for only a few hours, or looking to take photos along the way, then this would work for you! I thrifted the fringe shirt I'm wearing recently and couldn't wait to wear it. I paired it with a pair of high-rise jeans, and ankle booties with a heel (which are surprisingly comfortable to wear all day long.) Mack went for a 90's grungy school-girl look and I couldn't be moor obsessed. See what I did there? Please tell me you get the pun? Anyway, I love both of our outfits and hope you do too. 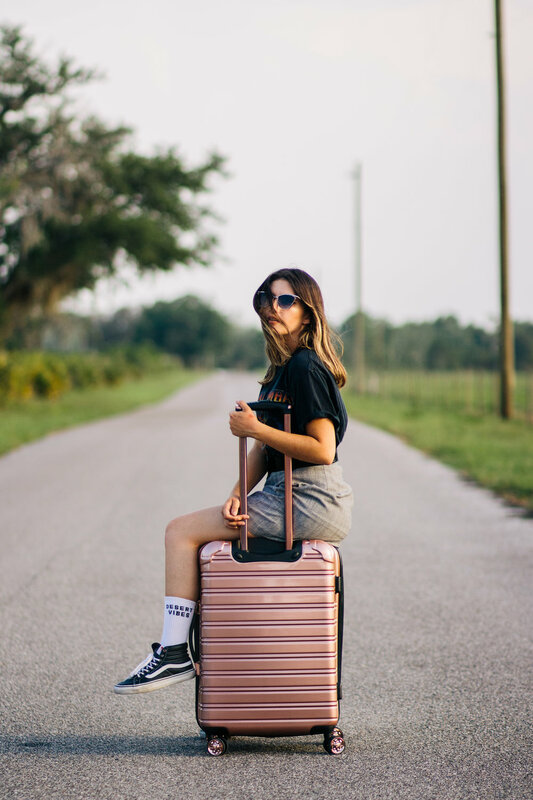 We partnered with iFLY Luggage, check out their website here. 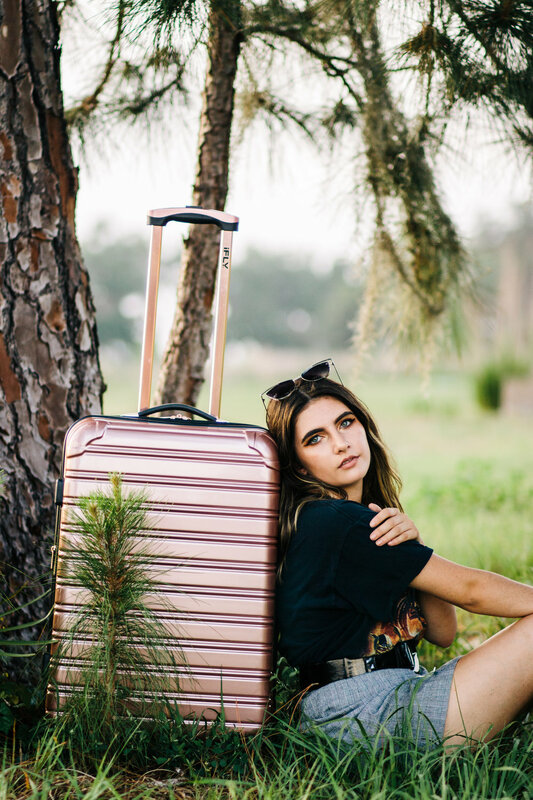 The suitcase I'm sporting is "Gold Fibertech: Limited Edition" for only $69! That's a deal! And with all that being said, I hope you enjoy this look book, let's get on to the photos shall we? PS: WE ARE BOTH GIVING AWAY A SUITCASE ON OUR INSTAGRAM. MAKE SURE TO CHECK OUT OUR IG'S FOR MORE INFO.